Workers in China's express delivery or courier industry, which contributes 0.67 percent of GDP and handles more parcels than the US, Japan and EU combined, have raised concerns on Chinese online communities over vicious competition, workers' rights and environmental issues. The comments came after the Ministry of Transport (MOT) announced on Friday that the industry handled about one in every two parcels in the world and ranked No.1 in the world for a fifth consecutive year in parcel volume. It also comes after recent closures of several courier firms and a broader discussion on Chinese social media on the hectic "996" work schedule, which refers to the 9 am-9 pm workday, six days a week. 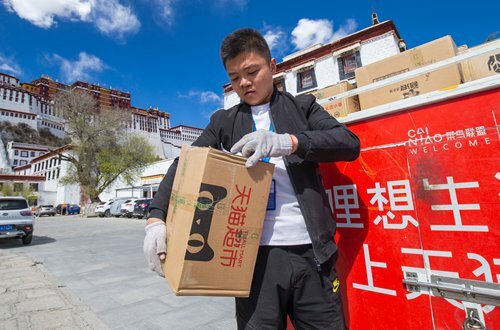 Chinese delivery firms handled 50.71 billion parcels in 2018, up 26.6 percent from the previous year, while business revenue grew 21.8 percent year-on-year to 603.84 billion yuan ($89.83 billion), according to the MOT report. In 2019, the industry is expected to register 700 billion yuan in annual revenues, up 18 percent, noted the State Post Bureau (SPB) under the MOT on Thursday. However, a post on online community tianya.cn noted that industry restructuring and stiff competition is driving out weaker companies such as rufengda.com, and there are worries about rising vicious competition. On Sina Weibo, comments concerning about environmental protection also prevailed. Ma Jun, director of the Beijing-based Institute of Public and Environmental Affairs, commented on his Twitter-like Weibo account that the need for green packing and logistics is imperative. There are also voices calling for improvement of employees' rights and benefits. According to a survey of 6,000 delivery workers in 31 provincial-level regions conducted by the SPB and released in February, long work hours are a feature of their lives, especially during online shopping promotions. Contrary to common belief that they earn more than 10,000 yuan a month, the surveys found most delivery personnel earn less than half that much. Wang Wei, CEO of Chinese delivery service company SF, reflected on Friday on his actions since the company floated on the Shenzhen bourse in 2017. He said he felt sorry for being shortsighted and pressed by investors' demands and overlooking employee benefits. Wang vowed to put delivery workers' happiness as his long-term goal, according to a report of industry site ithome.com on Sunday. Xu Yong, chief consultant at China Express and Logistics Consulting, told the Global Times on Sunday that part of the vicious competition on shipping rates stems from the fragmented nature of the industry in China. "As the industry consolidates, the competition will shift from price to the quality of services," Xu said, noting that four leading US express delivery companies account for 95 percent of the US market.